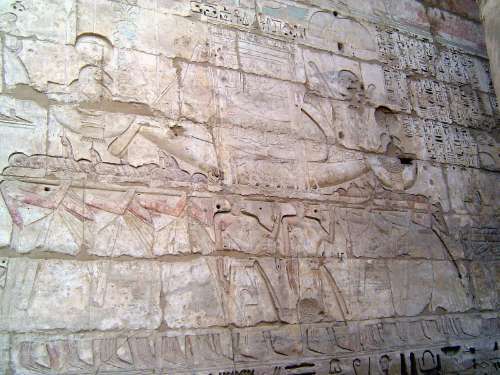 The Temple of Hatshepsut is the icon of the West Bank of the Nile at Thebes, but there's more for the visitor to see and learn here at Medinet Habu, the memorial temple of Ramesses III. 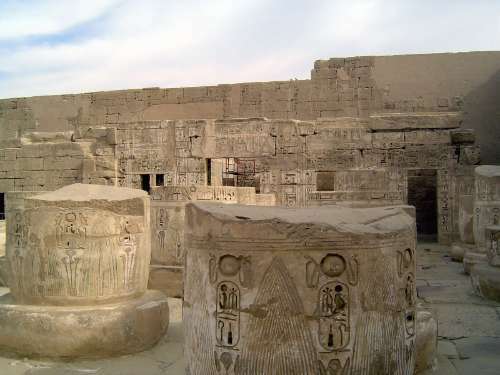 The name Medinet Habu, or City of Habu, refers almost accidentally to an architect of the 18th Dynasty named Amenhetep, son of Habu, whose own temple lies to the north. 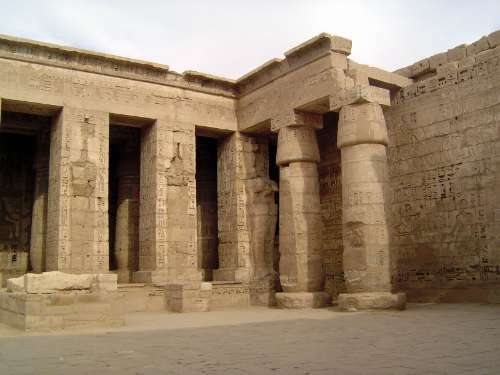 Just as the temples at Luxor and Karnak were known by other names in antiquity, the site of Medinet Habu was built, with vast prolixity, as the Mansion of Millions of Years of the King of Upper and Lower Egypt User-Ma'at-Ra-Mery-Amun in the Estate of Amun on the West of Thebes. 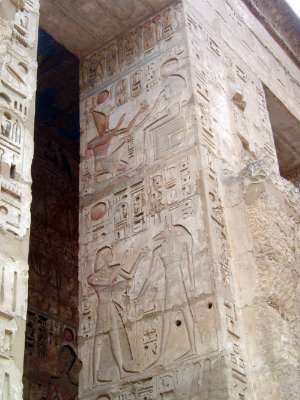 You can see the appeal of Medinet Habu. 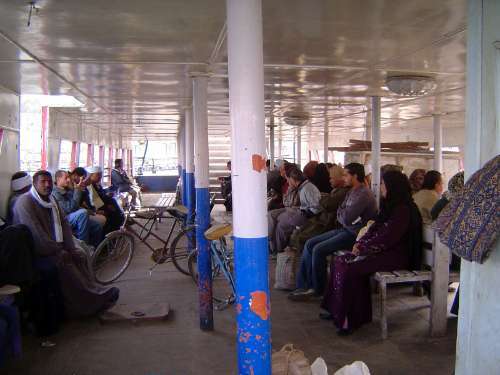 To get there, we cross the Nile on one of the frequent ferries. 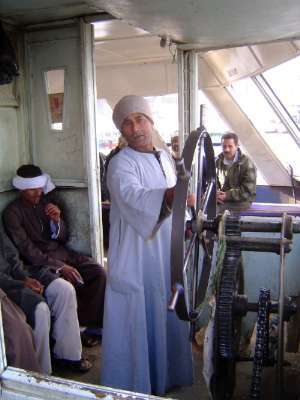 On the west side of the river, an old Persian Wheel has been put to better use as a revenue-earning photo-op. 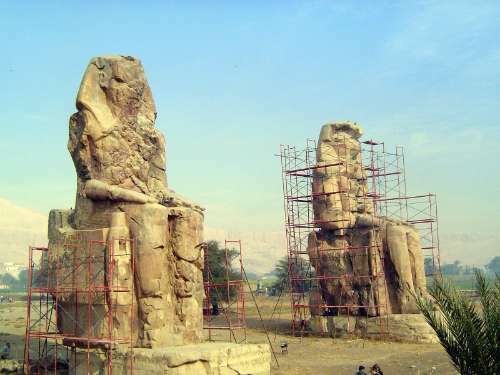 In the distance, cliffs border the Nile Valley; in the foreground the Colossi of Memnon represent Amenophis II, of the 18th dynasty. 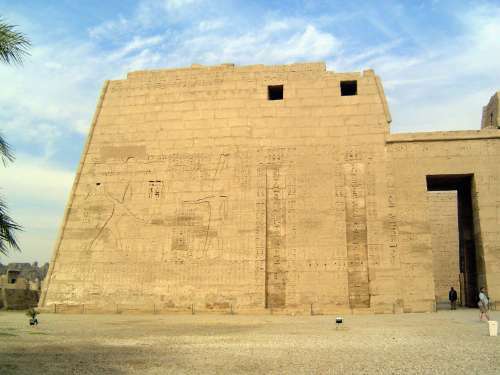 A mile farther west, and off the main road, this is the entrance to Medinet Habu, seen here from the north side. 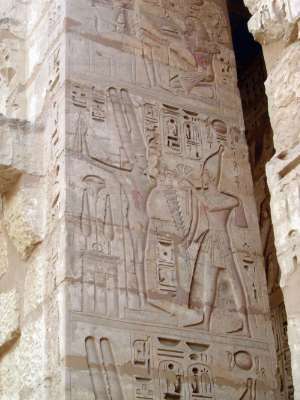 In the center is the pylon of Ptolemy, with its two columns. To the right, set back in the distant sunshine, is the main entrance, the so-called high gate. Here's that high gate straight on. 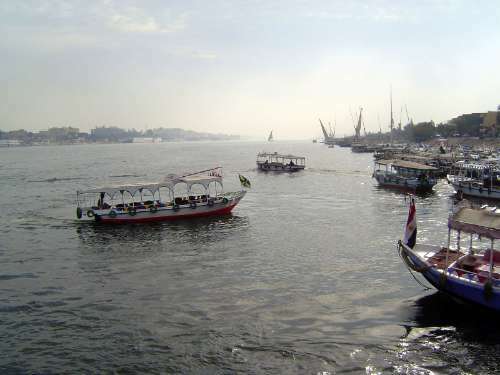 The crenelations are not just stylistic; they hint at the very real security problems faced by a weakened government facing an impoverished people. 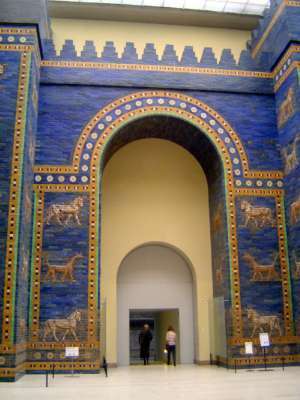 The gate is reminiscent of the gates of ancient Mesopotamia, exemplified by Babylon's Ishtar Gate, shown here as reconstructed in Berlin's Pergamon Museum. 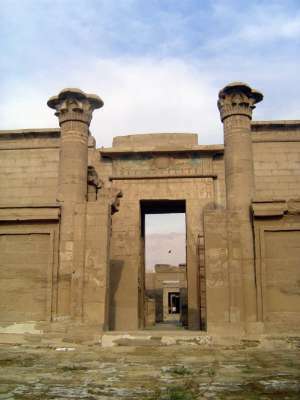 Here's the formal entrance, through the Ptolemaic gate. 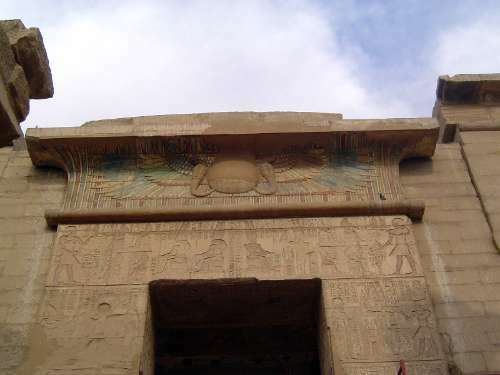 Over its door is a winged sun, symbol of Horus. 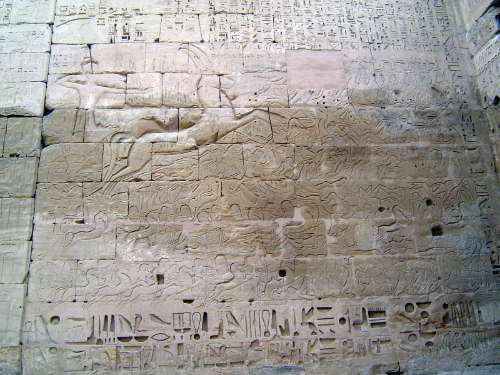 Ramesses III's name appears, too, implying his divinity. 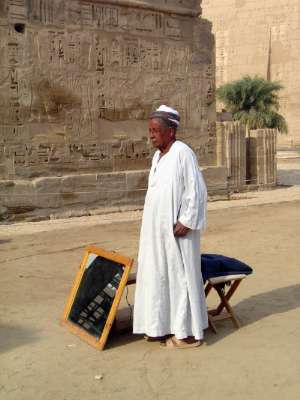 Inside, a man with a mirror. He adjusts it now and then. Why? 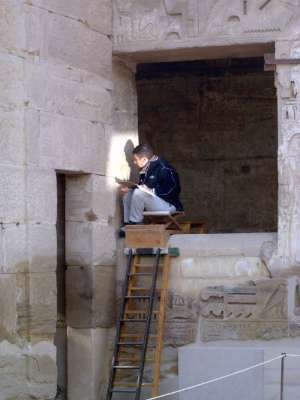 He's beaming light to a member of the team fielded by the Oriental Institute of the University of Chicago. How's that for "appropriate technology"? 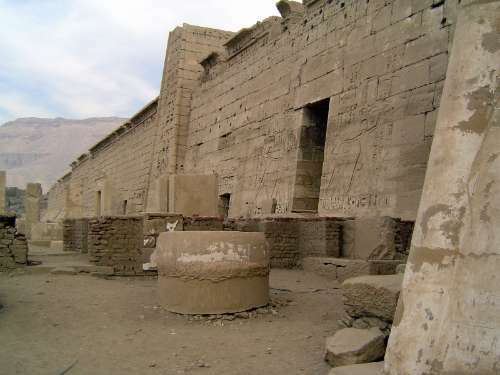 The building they're working on is the small Amun Temple, begun in the reign of Hatshepsut. 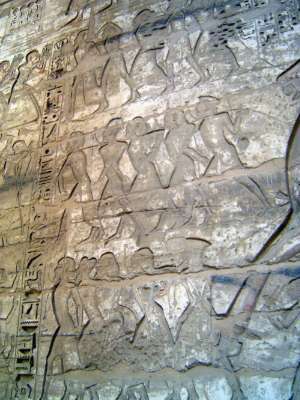 Defaced, it was restored and decorated by order of Ramesses III. 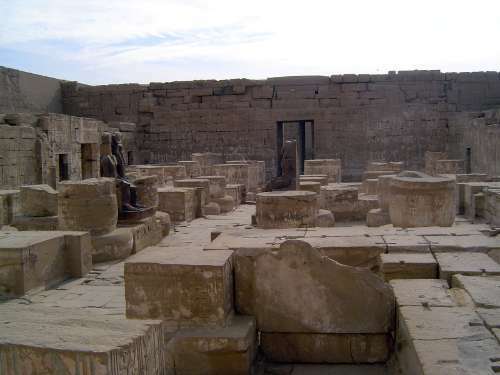 The small temple stands on the north side of this forecourt. 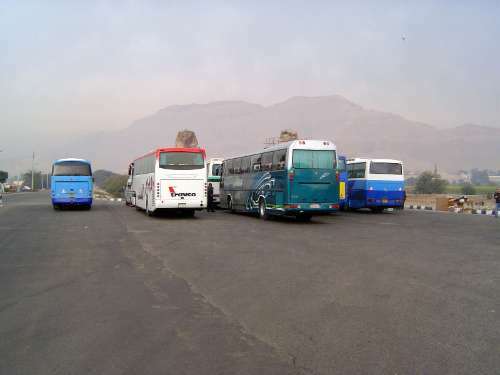 The open space was once crowded with smaller buildings. 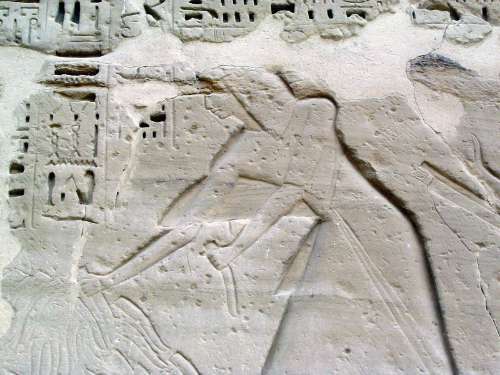 On the face of the first pylon is this image of Ramesses III holding his enemies by the head and offering them to Amun, who holds a short sword. 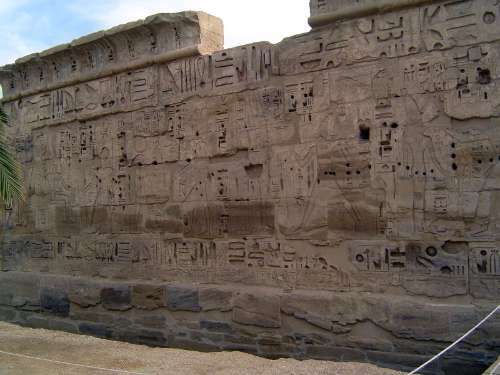 There's a lot more like this on the other side of the pylon, and it makes you wonder what this place was really like. 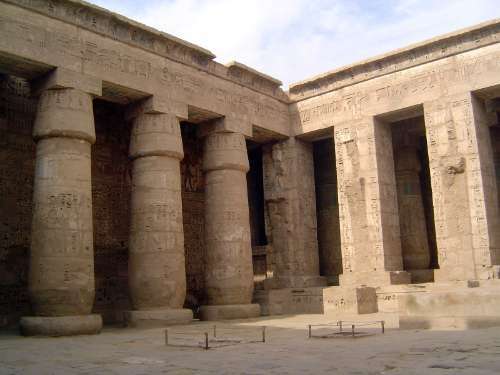 We've stepped through the gate in the pylon and are in the first court and looking here at its south colonnade. 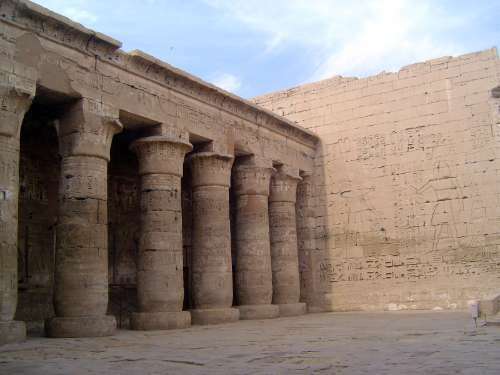 The king's residence lay beyond this colonnade and to the south. 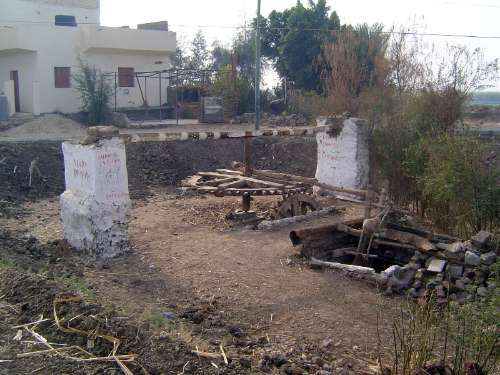 It was not on the axis of the temple. 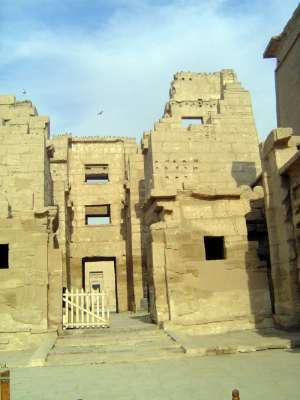 The north side of the first court has a line of Osirid columns facing the royal palace to the south. 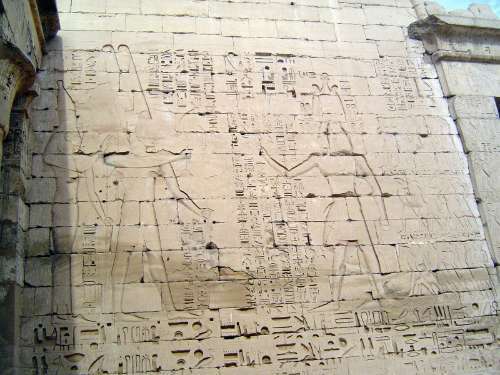 Small figures of Amun sat on the shoulder of these statues and implied that the king was beloved of Amun. 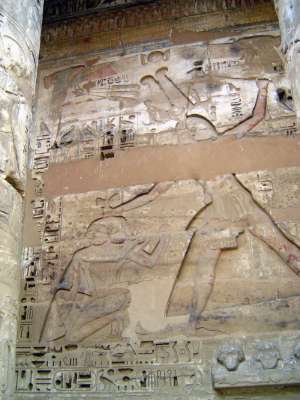 The other walls are devoted to the pharoah's invincibility. Bound prisoners, their hairstyle indicating Palestinian origin, are led to captivity. They are no match for the king. Prisoners held by their hair beg for their lives. 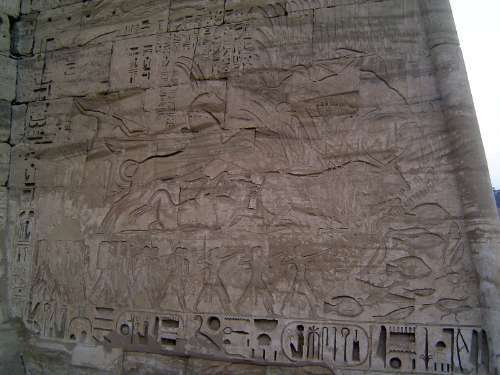 Here, on the back of the first pylon, the king in his chariot drives through battlefield chaos. 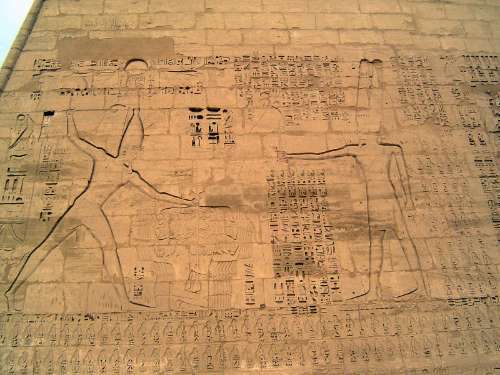 Despite the suggestion of invincibility, the incised hieroglyphics, deliberately cut so deeply they were next to impossible to eradicate, hint at the insecurity of the regime. 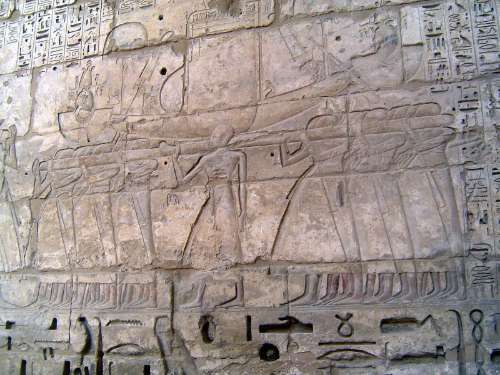 An especially gory panel, with baskets of body parts offered as an accounting of enemy deaths. 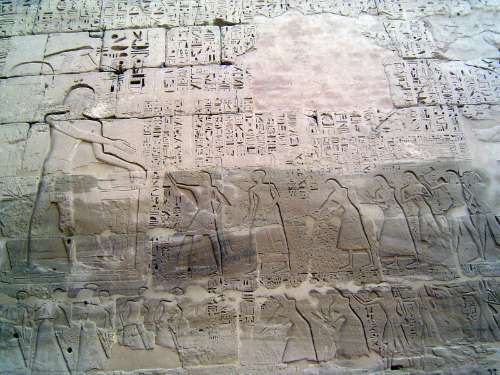 On the west wall of the first court, pharaoh, on the right, offers prisoners of war to Amun-ra and his wife Mut. Passing through the second pylon. 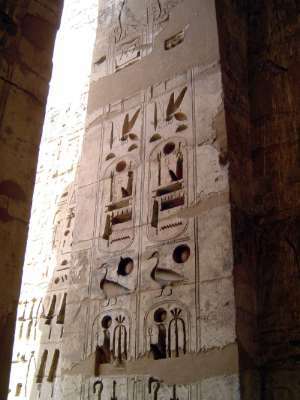 Defaced Osirid columns on the west face of the second courtyard. 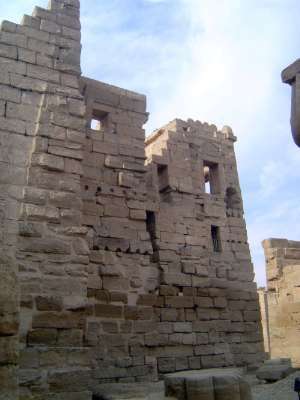 Parts of the west and north walls. More body counts, in this case with severed hands. It's not all gore, however. 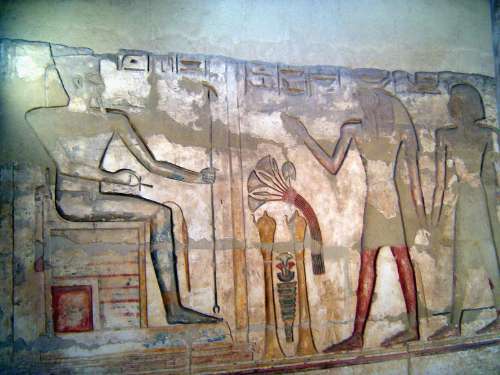 Here, priests carry the sacred bark of Amun. 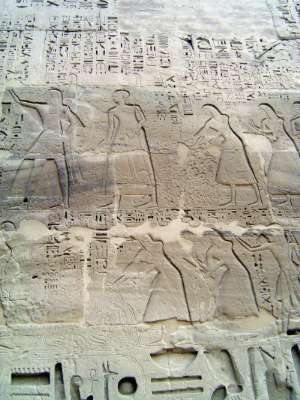 The west face is covered with images of offerings to the gods, in this case Ramesses III making offering to Amun-Ra. 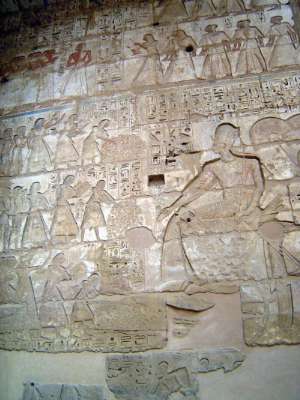 The king makes offering to Khonsu, indicated by the solar disc and crescent moon under it. 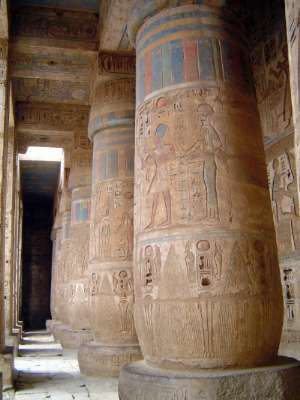 The paint is especially well preserved on the sheltered columns on the west side. 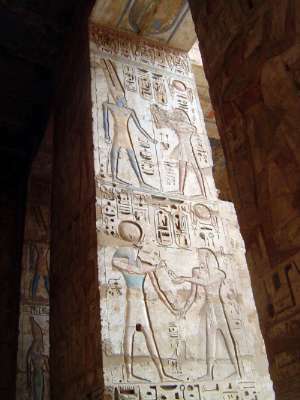 Farther west, not much is left of the hypostyle hall besides stumps. Most of the column drums were mined as though from a quarry. 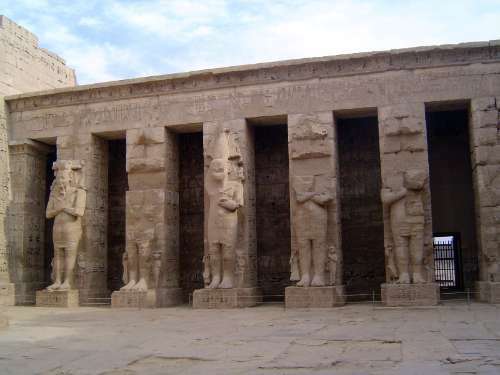 Re-use was an old story, however; even the black statues here were taken by Ramesses III from the Temple of Amenhetep III and put here. 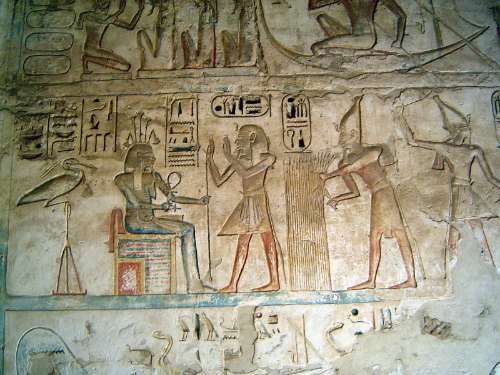 In a room to the side, the king receives an offering from Thoth and a priest. 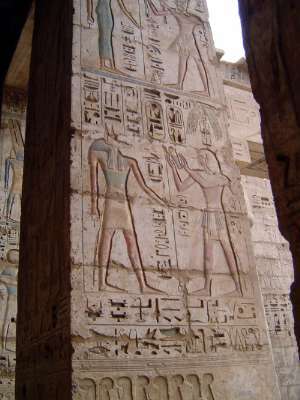 In the same room, Ramesses III worships Hapy, the Nile god, who holds the symbols of life. 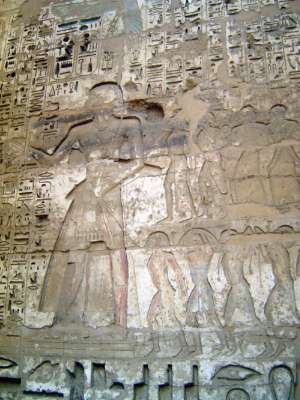 Behind Hapy is the Benu bird, father of the gods. 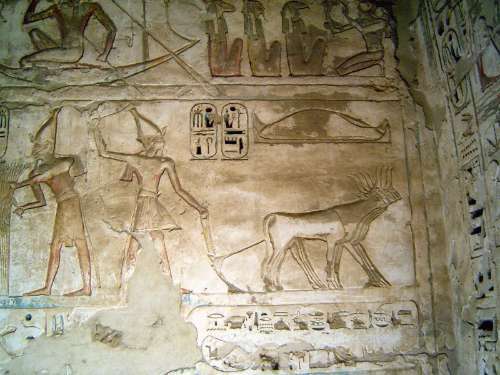 Behind the king is another image of him cutting wheat in the afterlife. 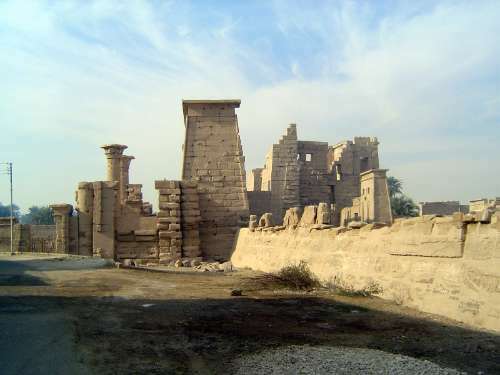 We've come outside the south wall of the palace and are looking west. 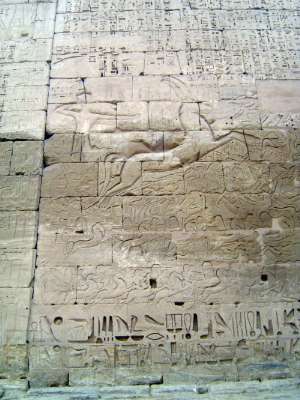 A famous picture here shows a royal hunt, with pharoah in his chariot killing bulls in the marsh. 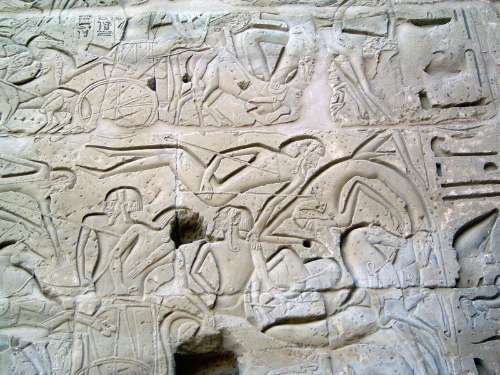 Fish and birds in lower right suggest the richness of the place.